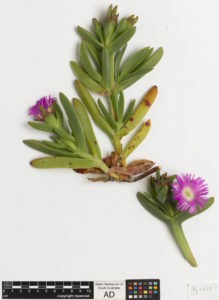 Herbarium sheet – before the plant is dried, of Carpobrotus rossii. Photo: State Herbarium. Among the amazing geological features of an ancient landscape a plant which might go unnoticed except when flowering is the native coastal species of Pig-Face, Carpobrotus rossii. In fact, Carpobrotus (Pig-Face) is a world-wide genus of succulent plants, with species native to South Africa, Australia, South America and California. In South Australia there are four species of Carpobrotus and two species in a closely related genus Sarcozona. 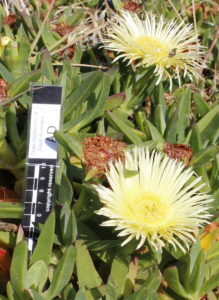 Carpobrotus modestus and C. rossii are native to South Australia as are the two Sarcozona, S. bicarinata and S. praecox. 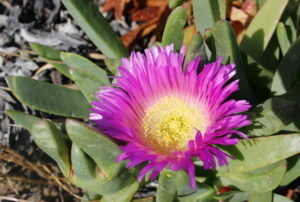 In the coastal areas of Hallett Cove the native species, Carpobrotus rossii is an important member of the ecosystem forming dune protecting ground cover and fruits that animals eat. Carpobrotus edulis flower type, this plant likely to be a hybrid backcross to C. edulis. Photo: C. Brodie. However, South Australia also has a species of Carpobrotus that is an introduction from South Africa, Carpobrotus edulis, which is listed in the Global Invasive Species Database for 24 countries. Honorary Research Associate Dr Hellmut Toelken from the State Herbarium of South Australia has been researching the taxonomy of this group and discovered that some pairs of species may form hybrids in South Australian locations. A partnership between the State Herbarium, The University of Adelaide and The Samphire Coast Icon project and Adelaide and Mount Lofty NRM applied molecular techniques to work out what was going on. The DNA analysis that this project conducted revealed that Dr Toelken was correct, and in fact there are many hybrids forming between the local native species and the introduced one. Hybrids are widespread in many areas, in fact where the two species come into close proximity. A big problem is that while the yellow flowered C. edulis is relatively easy to identify, the hybrids in South Australia appear to be typically pink flowered plants. Hallett Cove Conservation Park is well known for its geological and archaeological features, and is just outside of Adelaide. F1 C. rossii X C. edulis South Australia. Photo: C. Brodie. This entry was posted in The Plant Press on 28 February, 2017 by Michelle.